"Yellow is the color of sunshine. It's associated with joy, happiness, intellect, and energy. Yellow produces a warming effect, arouses cheerfulness, stimulates mental activity, and generates muscle energy." Whether you love it or hate it, you have to admit there's a certain cheeriness to yellow that's uniquely it's own. The space above makes me want to run around that house and jump on the bed. Yellow is definitely my go-to energizing color. Missypixie, congrats! Thank you Hot Digital Dog for an awesome giveaway! 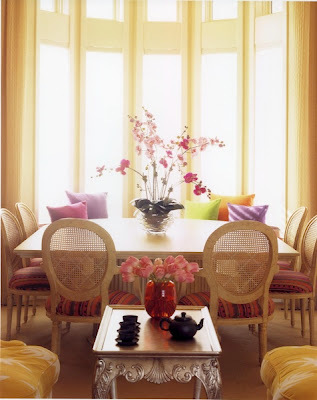 i love yellow accents in a room! they make everything else look so cheerful!! Love the yellow and white bedspread! It's true about yellow it's so grey and dreary here and a lot of people inside homes are painted yellow I thought it was so weird. Now I understand winter year 2 and not much sun. I love this. Yellow, makes everyone feel happy. I guess that's why McDonald's has the "Golden arches"
Yellow is pure joy... instant happy!! Yellow is my favorite color! I just saw a bunch of retro inspired kitchen appliances at Target- I was so tempted to make over my kitchen completely. I never tire of seeing yellow! I've been trying to think of ways to use it in the new house. Oh my, that Cloud chair looks amazing with all of the bright yellow. Love it! Funny you should write about this... Just finished painting my living room last night and it is most definitely yellow! It makes me happy just to be in there! that first room is so beautiful it almost makes my heart ache!